This past week, some of my congregants asked me: What does Jewish tradition have to say about solar eclipses? Like many ancient peoples, the Jews did not develop a scientific understanding of eclipses until much later in its history. Before we examine what exactly Jewish tradition says about this topic, I would like to preface my remarks with some general observations drawn from human history. 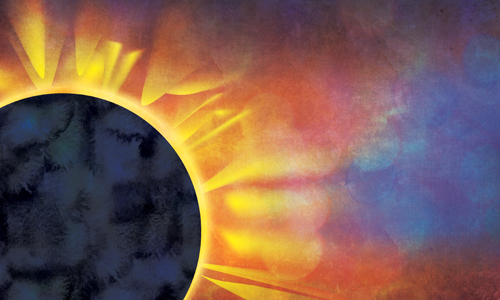 The human evolution regarding how eclipses occur forms the cultural backdrop that will help us better understand and appreciate the views that emerged in Jewish folklore and history. When our prehistoric ancestors first began observing the sun, moon, stars and planets, they realized that all life on this world depends upon the orderly movement of these celestial bodies. Should one of these bodies get displaced, the ancients feared that the world might come to a sudden end. Without the aid of science to explain how and why eclipses occur, the ancients resorted to myth to explain the nature of these anomalies of nature. Some of these myths portray the Sun fighting with its lover, the Moon. Other myths depict the sun and moon making love under a cloak of darkness. One myth that has enduring value is that the belief that the concord and well-being of the Earth depends upon the Sun and the Moon. Although we live in a scientific world, still, nothing conveys the visceral power of this realization such as the power of myth. It is in the realm of myth all these celestial bodies become larger than life. According to ancient Egyptian myth, the evil deity Set disguised himself as a black pig and leaped into the eye of his brother Horus, the sun deity and blinded his eye. But eventually, Horus regains his vision through the work of Thout, the moon goddess, who regulates such disturbances as eclipses and is also the healer of eyes. In one of the ancient depictions, the emblem of the winged Sun resembles modern day pictures of the sun’s elongated corona. It is important to remember that myth and science have one thing in common: each approach attempts to understand the order and mysteries of the universe. Sometimes mythic expositions can be very imaginative and profound. The male Moon married the female Sun. But the cold Moon could not satisfy the passion of his fiery bride. He wanted to go to sleep instead. The Sun and Moon made a bet: whoever awoke first would rule the day. The Moon promptly fell asleep, but the Sun, still irritated, awoke at 2 a.m. and lit up the world. The day was hers; the Moon received the night. The Sun swore she would never spend the night with the Moon again, but she was soon sorry. And the Moon was irresistibly drawn to his bride. When the two come together, there is a solar eclipse, but only briefly. The Sun and Moon begin to reproach one another and fall to quarreling. Soon they go their separate ways, the Sun blood-red with anger. Although eclipses are not specifically mentioned in the Tanakh, but there are some passages that speak about celestial anomalies that include the darkening of the skies—either by clouds or eclipses, or some inexplicable phenomenon. For example, the prophet Isaiah says, “I clothe the heavens in mourning, and make sackcloth their vesture” and this verse could be alluding to a solar or lunar eclipse. The medieval exegete Ibn Ezra (1089-1167) thought that the verse, “I go about in sunless gloom, I rise in the assembly and cry for help” (Job 30:28) might also refer to solar eclipse since the verb קָדַר (qāḏǎr) means to grow dark, or the darkening of the sun and moon. Perhaps the most important passage that bears wisdom on our discussion is from Jeremiah 10:2.
though the nations fear them. Throughout the ancient Mesopotamian world, people worshiped the celestial gods (sun god, moon god and Venus particularly; in Babylonia, Shamash, Sin and Ishtar respectively) were primary in most ancient religions. Their followers looked for astrological signs and omens how to live their lives. Human beings were believed to be at the mercy of these cosmic deities, and that is why Jeremiah warns the Israelites to abandon these foolish beliefs. Jeremiah’s warning is no less relevant today. In the next section, we will give some examples of how some rabbinic teachers rejected Jeremiah’s wise teaching. And the Talmud goes on to elaborate about the root causes of eclipses. I can sense what some of you are probably thinking—modern Jews don’t think or believe this way! Let us borrow a page from Maimonides’ play book. We are not obligated to justify every remark found in the Talmud if it violates common sense, science, and reason. This is not meant as a blasphemous criticism of the rabbis, it is merely a statement of fact. All of us today living benefit from the evolution of our society. We are no longer living as Carl Sagan once described, “a demon-haunted world.” Socrates once said, “We are all midgets standing upon the shoulders of giants” and as a result, we are able to see further than our forbearers did. The Sages taught that on account of four matters the sun is eclipsed: On account of a president of the court who dies and is not eulogized appropriately, and the eclipse is a type of eulogy by Heaven; on account of a betrothed young woman who screamed in the city that she was being raped and there was no one to rescue her; on account of homosexuality; and on account of two brothers whose blood was spilled as one. And on account of four matters the heavenly lights are eclipsed: On account of forgers of a fraudulent document [pelaster] that is intended to discredit others; on account of testifiers of false testimony; on account of raisers of small domesticated animals in the Land of Israel in a settled area; and on account of choppers of good, fruit-producing trees. To Rashi’s credit, he admitted, לא שמעתי טעם בדבר —“I do not have an explanation for this …,” and I would venture to say Maimonides and the other rationalist medieval thinkers of his age probably felt the same. But the same cannot be said about the Kabbalists, for their mystical writings often gives credence to superstition. This was one of the principle reasons Maimonides warred with the Kabbalists regarding their use of magic and other superstitious practices. Hassidic homes still feature amulets designed to chase away the evil eye. While most ancient rabbis were unfamiliar with Greek science and astronomy, there were some notable exceptions. The Talmud records, “Rabban Gamaliel had a tube through which he could see at a distance of two thousand cubits across the land and a corresponding distance across the sea” Steinsaltz explains that Rabban Gamaliel utilized a device known as the astrolabe, which was first invented by the Greek astronomer Apollonius of Perga between 220 and 150 B.C.E. This device made it possible to make astronomical measurements regarding the altitudes and movements of the stars; it was especially used in navigation for calculating latitude before the sextant was developed. We must not think all rabbis were primitive, but they were, after all, men of their age. Personally speaking, I think the mythic accounts depicting the eclipse as a dangerous phenomenon of nature were more correct than moderns might be willing to admit. That being said, the Talmud and other mythic accounts overlook the most obvious reason why the ancients feared solar eclipses: blindness! As we read in the news the other day, hundreds of thousands of people across the world might go blind or have their vision permanently impaired as a result of gazing at the solar eclipse. There can be no doubt this was certainly no less true in primal times and this simple fact is probably why the ancients viewed the solar eclipses with trepidation and fear. Mark Littmann, Fred Espenak, and Ken Willcox, Totality: Eclipses of the Sun (New York: Oxford UP, 2008), pp. 43-44. Ibn Ezra thought it might be referring to angels. Cf. Job 6:16; 30:28; Jer. 4:28; Joel 2:10; 4:15; Mic 3:6. Mekhilta Bo, 1.; BT Sukkah 29a. BT Sukkah with Steinsaltz’s Commentary Sukkah 29a. See Jeremy Brown’s fine article, The Great American Eclipse of 2017: Halachic and Philosophical Aspects, in http://www.hakirah.org/vol23brown.pdf. See also Rabbi Tendler in Moreshet Moshe v. 2 p. 51 quotes Rav Moshe Feinstein as explaining that “there’s no bracha for seeing a solar or lunar eclipse and in fact it is a negative sign” And the Responsa Aseh Lecha Rav 150 agrees that a beracha should not be recited because no such beracha is mentioned in the Gemara.